So, the big reveal! 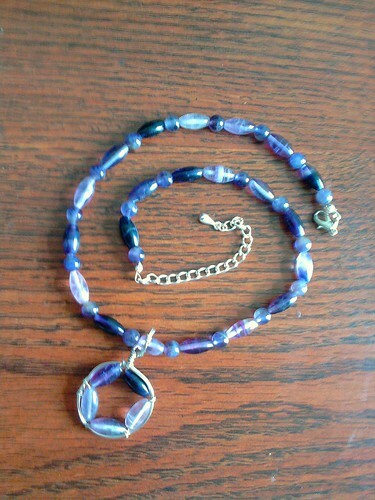 I mentioned that Dad asked me to make some jewellery to auction off for a fundraiser that he is associated with. I have finally finished the sets, and can now show them off. More than just a worthwhile project, it has inspired me to dust off my crafting blog (I know, *another* blog!) and start thinking about selling my crafts on Etsy again. I haven’t listed anything yet- with this project done I have two gifts to work on and a few ideas I want to try out, so that should keep me plenty busy for a bit, but now I have a special place just to showcase my crafts. You’ll see a few repeats of items I posted here in the past, but there’s lots of new things as well. Sorry for my lack of action. Work has been so hectic lately that I have been pretty much staying offline on weekends. I spent so many hours glued to my desk Friday that the motion sensor light turned off on me- definitely a first. My friend M created the pattern and I’ve been dying to try it out. They’re about 6″ long and a little less high. 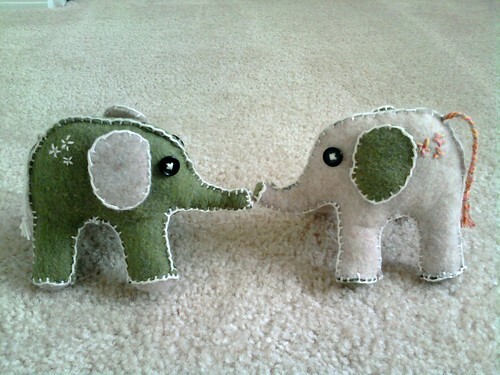 The olive was my first attempt and I had some trouble cutting the trunk- in fact, cutting out the felt was by far the hardest part of the process. The sewing was just an easy blanket stitch, but my hands definitely did not like cutting with scissors. The tan fellow has gone to a toddler of my acquaintance and the olive one stays with me. Clearly, it should be named Oliver or Olivia (still determining gender). They are both a little splay-legged however- didn’t quite get the stuffing packed correctly, maybe. I also did another crafting store run for jewellery supplies and found that another store had suddenly closed- my options are pretty limited unless I order online. 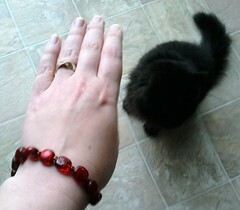 I should have everything I need to finish the bracelets for the fundraiser- I’ll work on those this week. I originally made the medallion larger, but it was disproportionate to the necklace. It looked terrific, and then I realised it was exactly “toddler hand-sized” so I changed it. If I can ever get these beads again then I will absolutely make another for myself because I really, really love the colours (they’re a little washed out in this pic, unfortunately, but they’re all lovely shades of purple). This was also my first attempt working with wired jewellery. I have plans to try a few more which you will see here eventually. Okay, not really. But I couldn’t come up with anything else for a title today, so that’s what you get. I bought myself an electric toothbrush. I alternately feel incredibly lazy or that somewhere a dentist is smiling at me. Drinking green tea every day, I watch the inside of my ceramic mug slowly turn brown and realised “Hey! That stain is on my teeth, too!” (Mind you, I don’t have the whitest teeth to begin with, but some pics from a few years ago showed up and wow, yeah, time to work on those pearly whites a bit more than usual.) I am still getting used to it- my gums bleed a little and my jaw feels buzzy from the vibration afterward. I am still figuring out how to keep the toothpaste from spinning off all over the mirror. It’s a process. My GI issues continue. No, I haven’t called the doc yet. Things are settling down and as unpleasant as it’s been, I haven’t really been sick. In fact, over all I’m doing very well- a lot less stiffness and pain. Exercising regularly really helps and I’ve had more energy. I suspect a lot of my issues right now are stress, which I am still having a hard time handling. I’m slowly percolating a thought that running a technical support shop isn’t good for my peace of mind, about the Buddhist pursuit of cessation of suffering and service to others, and how I really have a very Buddhist job, since I help ease other’s pain. I just need to stop taking it onto myself. if anything ever comes of that train of thought I’ll post it here. I woke up at 5:20 for my meds and never got back to sleep. I did sleep eight hours, but my brain wanted another hour even if my body didn’t. 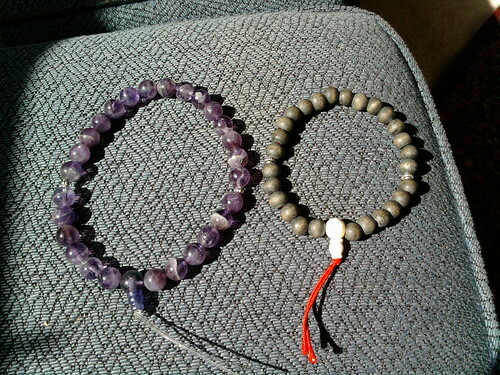 I’m not sure what to do with the over-large amethyst beads now, however. 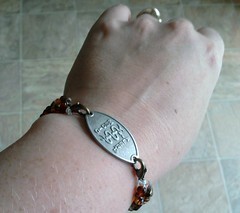 I may just make regular bracelets as gifts or somesuch. I have a few of the smaller beads left over so I could mix-and-match or make matching earrings (or the dream catcher idea my cousin gave me- that might be fun to try). I will probably add tassels to these eventually. My next project is the 54-bead red tigerseye mala, which will be a bit more of a project. Unfortunately, after running errands I heard a tornado warning on the radio. I was close to home so I quickly grabbed the mail and our recycling bins and brought them in so nothing would blow away. I scrambled to gather the cats, litter box, torch, radio, and extra batteries and ensconced us all in the mater bathroom. Hubby was still at work and kept calling, which I both appreciated but also was frustrated by since I was trying to fun around and get things done. Things got very noisy for a while but I don’t think we had any damage. It was excitement I did not need however, and now I have a better idea of where to gather and store our emergency supplies! Hubby got home not long after but had a terrible headache from the air pressure, and I was sore from rushing around, so it was a quiet evening otherwise. I am a bit achy today- I gave myself off from exercise last night but plan to at least stretch today after grocery shopping. Just realised that I didn’t check on the bird feeder this morning- I wonder if it’s still there! Well, my guru beads arrived from Potala Gate and I was really impressed with the quality of the stones and silk tassels I ordered, the prices were good and the delivery was fast. After some dithering I swapped out the spacers on my sandalwood mala for some of the silver beads I found and used a shell guru bead and cup. I am very VERY happy with this mala now- it’s just right (and I’ve discovered that I like the natural sandalwood scent much more than oils, which I haven’t worn in years due to sensitivity to strong smells). 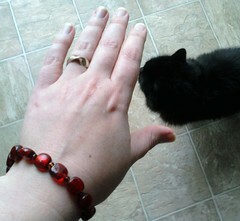 Same number of beads, vastly different size. I’m now unsure what to do- it’s not long enough to wrap my wrist twice. 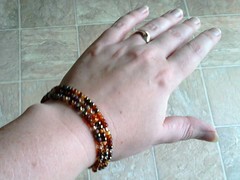 I may try and find enough beads to rethread a 54-bead mala. At that size it might be long enough for a necklace. 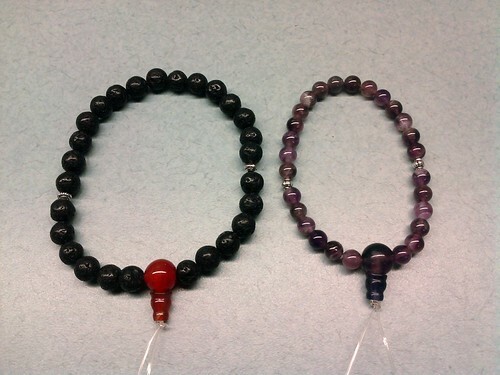 However, I really wanted an amethyst wrist mala (27-bead) so I may start hunting for another semi-precious bead source; the local craft stores may be convenient and inexpensive, but their options are fairly limited. There are one or local two beads shops I will check out, but I know that at least one has closed- darn economy. I am really enjoying making these however, and I’m only kicking myself that I didn’t start making these *before* the holidays so I could give more as gifts. I think that I would like to make a green jade wrist mala for myself as well, but clearly I still have a few lessons to learn. I think I’m slightly addicted so I expect there will be many more to give away. I missed the deadline for ChronicBabe’s craft blog carnival, but I’m so proud of myself that I’m sharing pictures anyway! I have recounted my medical bracelet angst in the past. Well, my service sent me their quarterly catalog/wellness brochure, and looking it over I was struck by the lovely pearl bracelets. And their prices, which were even higher than the sterling silver bracelet I’ve been tentatively admiring. Looking closely at the design I realised how smart it was- clasps on both ends attach to the loops of the medallion, making it easy to change out bracelet styles and much easier to put on and take off than my security clasp (and more attractive than my sport version). In fact, I already had all the same supplies from my jewellery making days. At that point lightning struck, a gong sounded, and the world stopped turning. I haven’t done much with jewellery-making in a while. Swollen joints are not very friendly towards fine motor skills, but stringing beads is super-easy, so I dug out my supplies and got started. The second bracelet took a little more work. I tried several different patterns and combination of beads. I did remember to use black thread, but my first attempt was a bit too short. I had a large red glass bead I had thought to use in the middle, but it was much too heavy and when I took it out I found that I needed to add two more of the medium beads to make up for it. I restrung it and accidentally left a little too much give in the thread, so I will definitely restring this one in the near future. I am really, really happy with how they both came out, and it’s so fun to finally use these beads for something I can wear every day at work. I have plenty more beads and findings, so I can make more as the whim strikes me. This definitely helps assuage my need for sparkly bracelets, without having to compete with a medical bracelet or struggle with difficult clasps. I just wish that I had thought of it sooner!